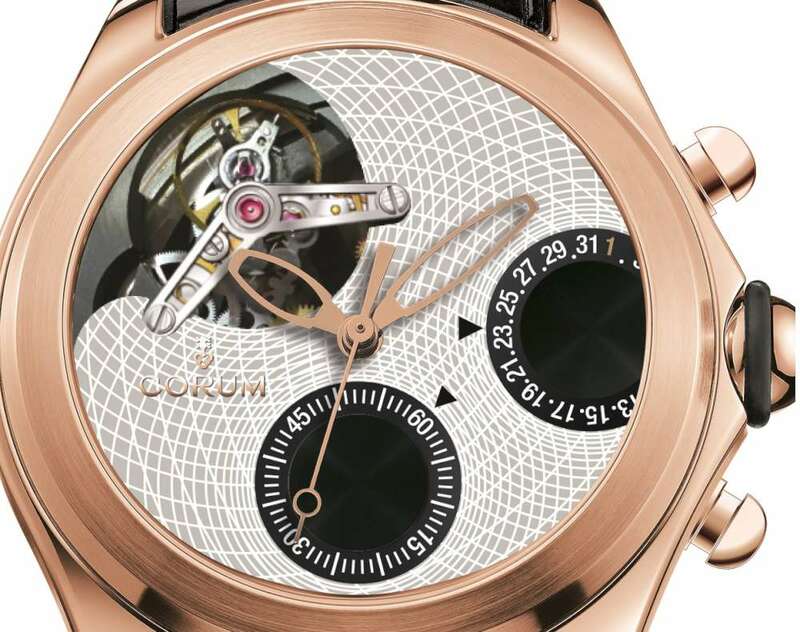 Corum’s Bubble is a super-ironic piece, with its domed watchglass and large size. Corum shows that there is lots of room for developing Bubble even further with two five-piece limited editions, the Bubble Tourbillon Chronograph, and the Bubble Tourbillon GMT. The Bubble Tourbillon Chronograph has a large well on the dial for the tourbillon at 10 o’clock, with chronograph seconds measured by the central hand, and chronograph minutes recorded by the disc subdial at 6 o’clock. Date at 3 o’clock. 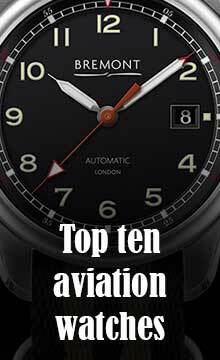 The watch is powered by the Corum CO398 movement, which is self-winding, and has a column wheel for controlling the chronograph function. It provides a power reserve of 45 hours. 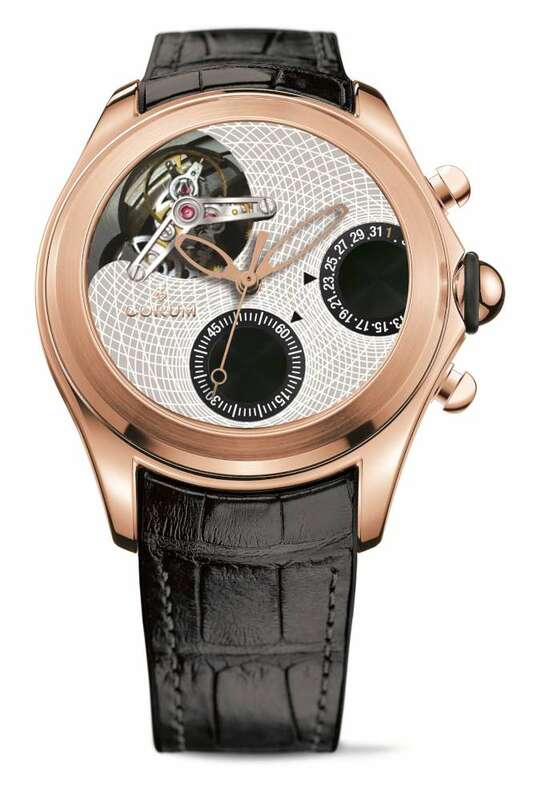 The Bubble Tourbillon Chronograph is reference L398/02977 – 398.100.55/0001 BG01. It is a limited edition of five pieces. The Bubble Tourbillon GMT has a similar appearance, with tourbillon at 10 o’clock, a subdial for the second time zone at 6 o’clock, a small day/night indicator at 7 o’clock, and date at 3 o’clock. The pusher below the crown advances the second time zone by one hour at a time, with the day/night indicator following suit. 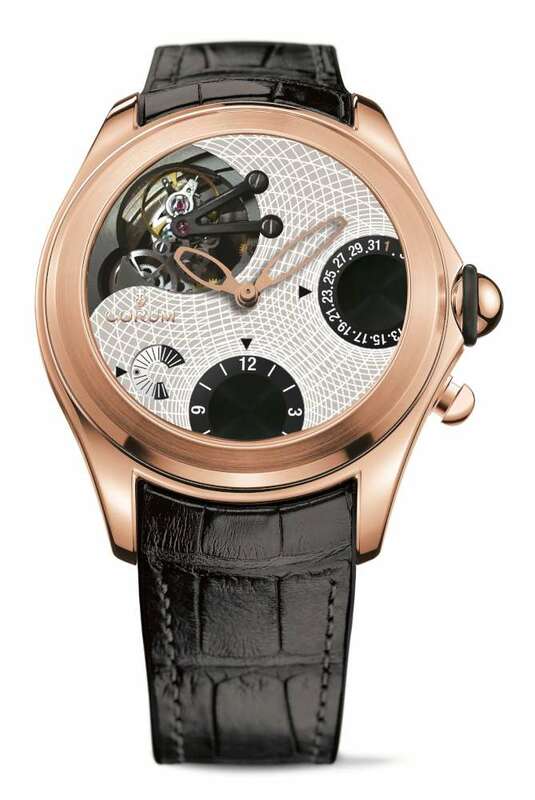 This piece is powered by the self-winding movement CO397, with 50 hours power reserve. The Bubble Tourbillon GMT is reference L397/02976 – 397.100.55/0001 BG01. Limited edition of five. 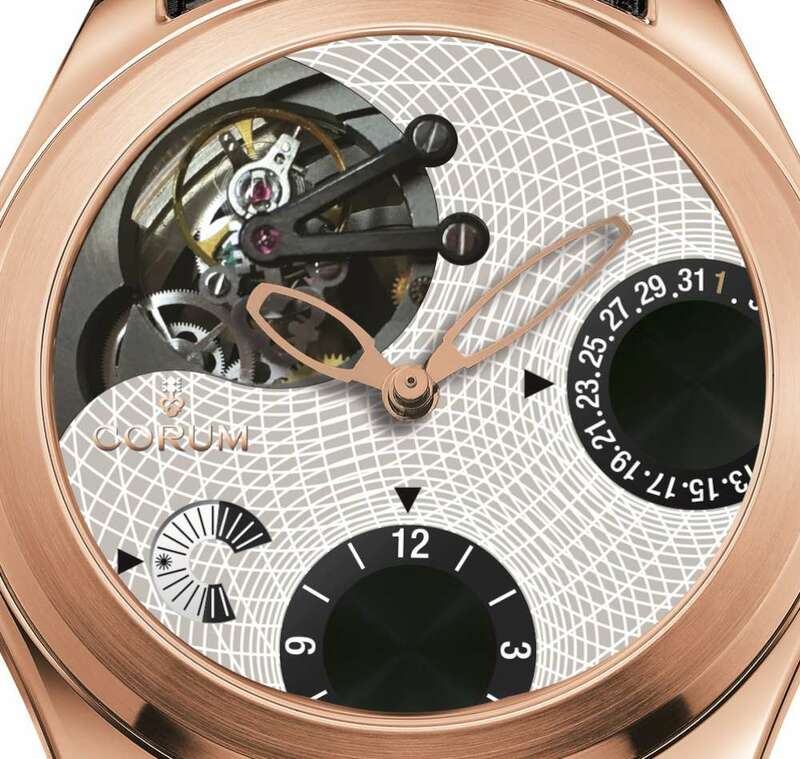 Both pieces have a 47mm case, total thickness 21 mm, in rose gold, and a light grey dial decorated with concentric guilloché that highlights the bubble geometry. The sapphire caseback reveals the movement; water resistance is 30 metres. Black alligator strap with calfskin lining and rose gold pin buckle. The prices of these pieces are presumably around 155,000 Swiss francs, I’ll update the post when I receive precise information.